Previous PostWordCamp Chicago 2009 – I’ll Be ThereNext PostFlip Mino HD. Empty. Time Left: 3:33. What? I’m also getting pretty fed up with Vonage’s price increasing. Seems to be every 4-6 months they are sending me an e-mail saying that unfortunately, a couple of services are going up 50 cents each. I’m one of the lucky ones who had to agree to 2-years of service, or I will be tagged with a $40 disconnect fee. @Justin: Wait ’til you try to leave, even after your two years are up. They will always try to keep you, find some way to bill you more on your wait out the door, or otherwise berate you or lie to you to retain you. It’s one of of the most customer-unfriendly experiences I’ve ever had. Reading around, you’ll easily find similar if not identical complaints from others. Good luck! You might want to look into what fee’s are being levied on vonage by state and federal mandates. Some of them may not be required to be passed on to customers but the government officials know that they will be passed on when they create them. LtVu: There are indeed fees put in place by govt entities, but Vonage is/was collecting several they were not at all required to collect, “just in case”. For a company that–at least initially–swore up and down they’d never be like a regular phone company, they’ve turned into pretty much exactly that. I suppose it could be argued that it’s all inevitable, but I’m not easily convinced. Thank you very much for stopping by and for your comment. Vonage’s fluctuating bills every month keeps me wondering what happened this time. It’s the fine print that gets us off guard. I travel a lot and need a telephone number that travels with me. I have to admit there are no real good alternative VoIP services. 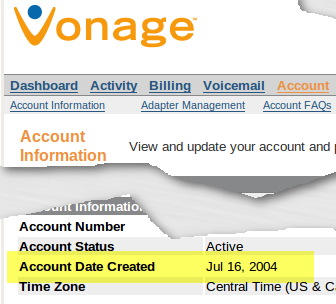 Vonage remains the most reliable of all. Until then I’m forced to stay with them. Unlimited is not unlimited. They claimed I have used over 3,000 minutes and without my permission, they changed my rate to $49.99 . With taxes and fees, it was over $65 pee month. Have anyone looked in to filing a lawsuit? Their advertising says unlimited minutes. But it is not.